Become a monthly donor and help eliminate poverty housing. HopeBuilders are the bedrock of Habitat for Humanity's housing ministry. 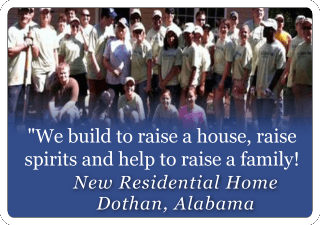 HopeBuilders provide Habitat a stable and reliable source of funding that allows us to plan ahead. Won't you join this special group? For less than the cost of one dinner out each month, you can become a HopeBuilder. Please join us today. Any amount will help change the lives of deserving families forever. Your love goes a long way. Become a HopeBuilder today! Whatever amount you would like to share, your generosity will earn you the gratitude of thousands of people in need of a decent place to live. 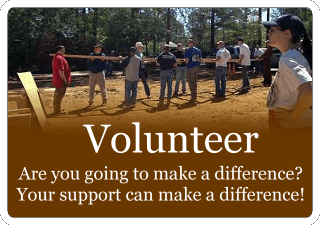 Wiregrass Habitat for Humanity or phone 334-792-8453. 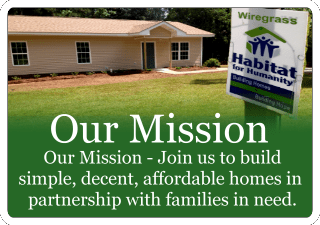 Thank you for considering a donation to Wiregrass Habitat for Humanity. Each gift you make helps a family in need of decent shelter. All WHFH donations are tax-deductible as allowed by law and will be acknowledged with a letter you may use for those purposes. Gifts made on-line are safe, thanks to our secure-server capability and will be put to good use by Habitat. We take seriously our responsibility to contributors, to those counting on our help to be wise stewards of funds entrusted to us.